(TibetanReview.net, Aug02, 2018) – All the religious institutions in the People’s Republic of China will be required to fly the national flag for the purpose of strengthening awareness of respect to the flag and preserve the flag’s dignity following a meeting of the country’s major religious associations in Beijing on Jul 31, reported the official globaltimes.cn Jul 31. 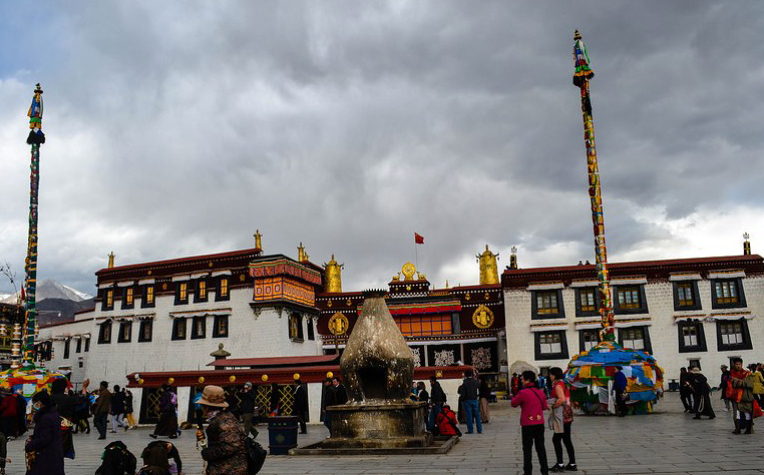 The requirement to fly the national flag not just over religious centres but also on all residential buildings was coercively imposed several years ago in Tibet Autonomous Region, especially Nagchu (Chinese: Naqu) Prefecture. It led to protests which the authorities met with brutal repression, large-scale arrests and long term imprisonments. The report said Chinese experts hailed the initiative for seeking to assimilate religion into a socialist society and as progress for religious development. It said the measure was proposed by the heads and representatives of national religious groups, including the Buddhist Association of China, the Taoist Association of China, the Islamic Association of China, and the Bishops’ Conference of the Catholic Church in China, all approved and controlled by the government. It was stated to be the religious leader’s sixth joint conference. However, unlike what happened in Tibet, the requirement under the current decision is that the national flag shall be raised at religious venues on China’s National Day, International Labor Day, New Year’s Day, Spring Festival, and other important festivals and celebrations of each religion. It has to be put up at prominent locations before the religious flags in one row. And the question how the national flag is raised and put up will be included in the index of evaluation of activities for selecting harmonious temples or churches, the report said. The decision showed that China’s major religious associations had reached a consensus on the sinicization of religions by integrating religious doctrines into Chinese culture, Xiong Kunxin, an ethnic studies expert and a professor at Tibet University in Lhasa, was cited as saying. The report said the move was meant to strengthen national consciousness, help religious believers better practice socialist core values, and carry forward the tradition of patriotism. The national religious associations were also stated to have called for organizing activities to study China’s Constitution and the National Flag Law, while stressing the need to sinicize religions and assimilate religions in socialist society. These have already been under vigorous and coercive implementation in Tibet for years. Taking part in the meeting was stated to be Wang Zuoan, deputy head of the United Front Work Department of the Communist Party of China Central Committee and director of the State Administration for Religious Affairs. The report noted that flags had been raised at all 69 religious sites – including Christian churches and Buddhist temples – in the city of Lanxi in East China’s Zhejiang Province to “have patriotism guide devotion to religions”.